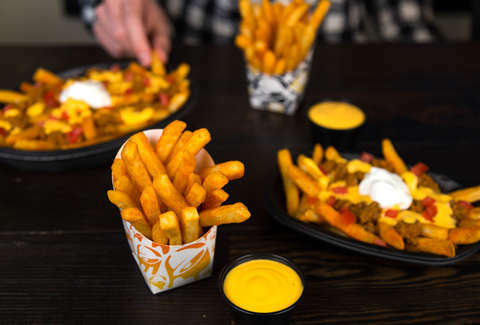 While the normal Taco Bell menu is a veritable enchanted cabinet of meat- and cheese-based wonders, the chain's first-ever Nacho Fries were a real revelation when they were released last year. And it was pretty hard to see them go. Then come back again. Then go again. But take heart, they’re coming back. Again! If you had the misfortune of missing out on them last time, you’ll be able to dip seasoned fried potatoes into cheese as God intended once again, starting on Thursday, January 24. Unfortunately, they'll once again only be around for a limited time, according to T Bell. But, if history is any indication, they'll be back again someday. If you’re confused about what a nacho fry is, 1) we’re sure you can figure it out, and 2) they’re seasoned French fries served alongside a warm nacho cheese dipping sauce. Does that sound kind of ridiculous? Sure. But you’re kind of ridiculous, and it also sounds great, so whatever. Like last time, you’ll also be able to get order the fries in their amped-up Supreme and BellGrande versions -- that means they'll come with toppings like beef, pico de gallo, nacho cheese, and sour cream. In short, you'll be able to make them your entire meal instead of just a side. There still won’t be ketchup, though. But that’s why Fire Sauce was invented.